Worried About Ransomware Cerber Virus? You are here: Home › Computers › Worried About Ransomware Cerber Virus? Viruses might have been annoying pop ups that you have ignored or have removed successfully when they slowed down your computer. However, there are new categories of virus programs that are becoming more malicious and can cause more harm and damage. One such category is the ransomware viruses. These are malicious programs that can affect a user’s system, encrypt useful files and programs and make the system useless without these applications running. When users wish to get the files back, decryption is offered at a cost. 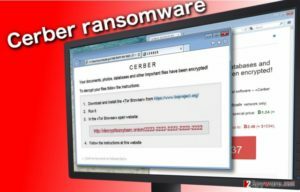 Among the new breed of ransomware viruses Cerber virus is one that might be difficult to remove from your system once its infiltrates your computer. The ransomware vary as per the encryption technology used. Some viruses hold systems to ransom by encrypting files while others pretend to help but are actually ransomware viruses. Cerber is a pretend ransomware which locks the user out of the system and then uses shock as well as embarrassing messages to force users to pay up in order to get back access to their system. Usually the pretend ransomware usually threaten to encrypt files but do not carry out the encryption in actuality. Cerber on the other hand, actually encrypts the files as well as pretends to be a friendly program that is trying to help a user get access to their system programs. This virus works with a Trojan virus that provides information about accessed filed and hard drive applications that are important in a user system. The encryption process takes time and one might be able to spot the slowdown of their PC and the appearance of multiple windows programs and applications. However, this might not be noticed by all. As a result, most people fall prey to the ransomware. Soon encryption of the files is completed. There is a ransom note posted on your desktop. You would be asked to pay up in order to get your files encrypted. How Cerber holds people ransom? The ransomware Cerber demands payment to be made through BitCoins. Most people who are dependent on their system and need access to their files urgently might want to pay up. However it is necessary to understand that, paying virus program makers might not guarantee that access will be provided to the files. At the same time, one would also be fueling their spurious ventures to create malware programs that create havoc on systems and are nothing less than criminal activities. It is best that you take preventative measures to protect your system from being infiltrated by malware. There are many antivirus and malware detection programs that offer scanning of suspicious malware activities including that of ransomware. Keeping your system updated with these tools is a necessity. In case your system has already been infiltrated, you might consider SureShotSoftware guides and tools to help remove or decrypt Cerber files that have been encrypted by the ransomware. This is a reliable site to visit for resources and guides on malicious programs.